Protect your eyes from harmful rays when you wear these Oakley Jawbreaker OO9290 Sunglasses in Polished White. The Jawbreaker™ is the ultimate sports design - answering the demands of world-class athletes with a 40-year heritage of uncompromising excellence. 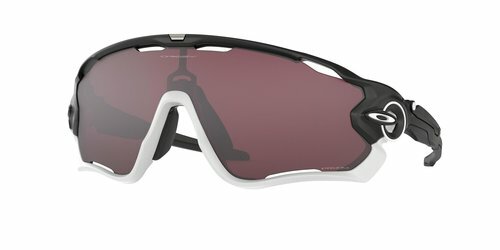 Oakley innovation has reached the pinnacle of performance by offering everything from surge ports for cooling airflow to Unobtainium® components for a comfortably secure fit. These glasses come with specially designed lenses. All Oakley lenses offer HDO® Technology which offers clarity; conventional lenses can magnify images but HDO® precision gives less distorted vision across the entire field of view. The lenses provide refraction, with regular lenses, objects aren’t really where you see them. HDO® offers a truer visual image so your brain won’t have to work overtime. Furthermore, these lenses offer UV protection; all Oakley lenses block 100% of UVA, UVB & UVC rays and harmful blue light up to 400 nm.